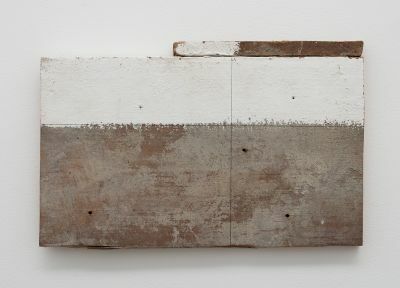 Since the 1980s, the Brazilian artist Fernanda Gomes has used ordinary and affordable materials to make objects and bricolages (always untitled) whose formal idiom recalls Arte Povera, minimalism, and Brazilian constructivism. Leftovers and lost, disregarded, or discarded items as well as commonplace objects such as glass, mirrors, magnets, strings, hairs, cigarette butts, newspapers, and old furniture are arranged on the scene of the exhibition, assembled in fragile and precarious constructions or consolidated and corded for more compact creations. Immersion in spaces and places is a key aspect of Gomes’s approach to art-making. She explores the characteristic qualities of a setting—the lighting, proportions, the materials, etc.—both through careful observation and by allowing them to affect her on a visceral level. Empty spaces, the artist believes, are not vacant; on the contrary, they teem with information. Both the placement and the constructive execution of her works responds to the exhibition space. Her site-specific installations often consist of an abundance of objects scattered across the floor and walls, gathered in clusters or rhythmically organized arrangements. Natural light generates an ephemeral play of shadows that activates the situations. The only paint the artist uses is white, which she cherishes as the “receptive color,” revealing even the subtlest shifts in the tonality and intensity of the light. Gomes has had solo exhibitions most recently at the Museo Jumex, Mexico City (2018); Galeria Luisa Strina, São Paulo, and the Alison Jacques Gallery, London (both 2017); Peter Kilchmann, Zurich (2015); the Centre International de l’art et du Paysage, Vassivière (2013); the Museu da Cidade, Lisbon, and the Museu de Arte Moderna do Rio de Janeiro (both 2012); the Museu de Arte Contemporânea de Serralves, Porto (2006), and elsewhere.